Tattoos are a great form of expression and if you’re thinking of getting inked here are a few small tattoo ideas. Choosing a tattoo can be fun and also extremely personal. People get tattoos to keep memories and experiences alive- or just because they might like it. 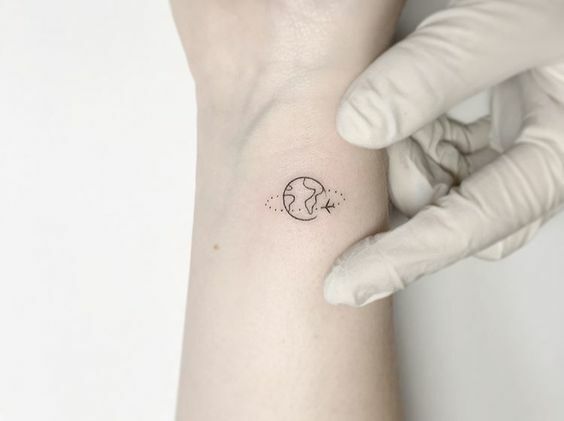 No matter your reason, we’ve got some beautiful small tattoo ideas that you can contemplate on getting. Getting a tattoo is always a massive milestone in life because it will be with your forever. Choosing a tattoo idea can become daunting and rather stressful. Our advice to fellow tattoo enthusiast would be to always choose wisely. Always ask yourself questions like whether or not the tattoo will be something you would want to see for the rest of your life. Don’t only think about it in the short term, because this decision can affect you in the long run. For instance, you wouldn’t want an exes name engraved on your skin ten years from now. Choose things that are meaningful to you and that you will be proud to carry with you throughout time. This way, every time you look at your tattoo you will feel good too and not reminded of bad times. In the end it all boils down to your personal preference and your choice. This is a decision that should be well thought out. If you’re a dreamer and always imagining being in different magical places then here’s some inspiration for you. A great way to make your dreams come true is by being reminded of it. If you like traveling than here’s the tattoo that would be a great idea. It’s got the world and an airplane going around it, which we just love! 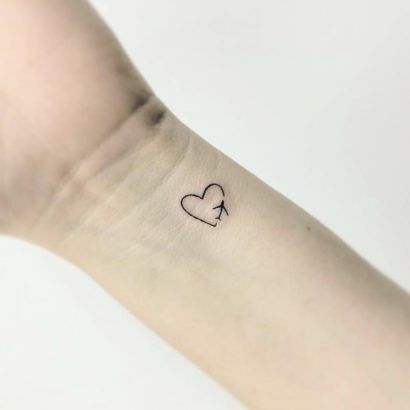 Certain people love flying and this could be the cutest small tattoo idea ever. It would be ideal for someone working in aviation and it would be easy to conceal at work. Nothing is quite as magical as being a dreamer. This ink inspiration is perfect for those who have a great imagination. It not only captivates a beautiful picture but it has some mystery to it too. After all, the moon does look like magical place. There’s something very sensational about getting an intimate tattoo. This doesn’t necessarily have to be provocative, but it can represent you as a being. 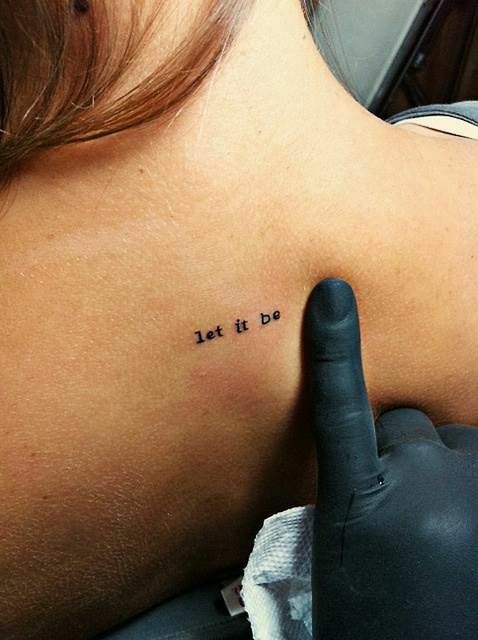 This tattoo is super cheeky and has the words “bite” inked. You can choose your own words to put on your intimate areas. What better way to express yourself than by using a single symbol that will sum everything up. 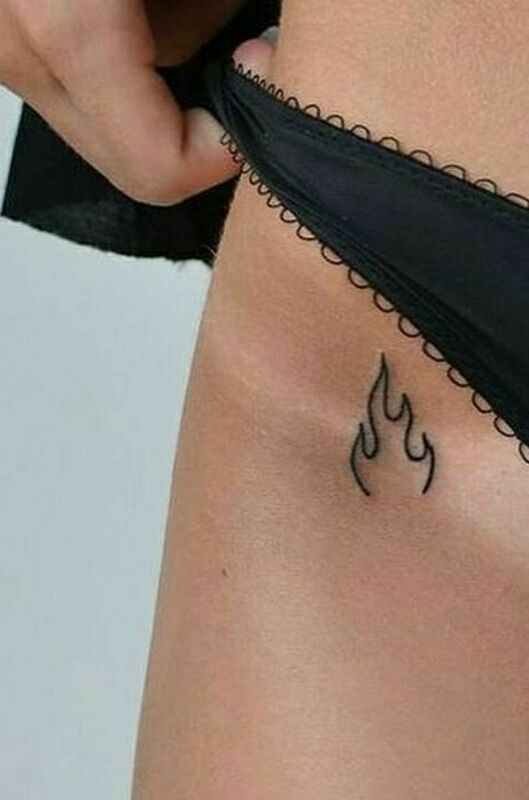 The flame is a cool way to remind yourself that you’re fiery. Another intimate area to get a tattoo is on the side of the breast. Again, you can choose whatever symbol is most appropriate for you. There are plenty of tiny heart options to choose from. Daily motivation is something we all need. 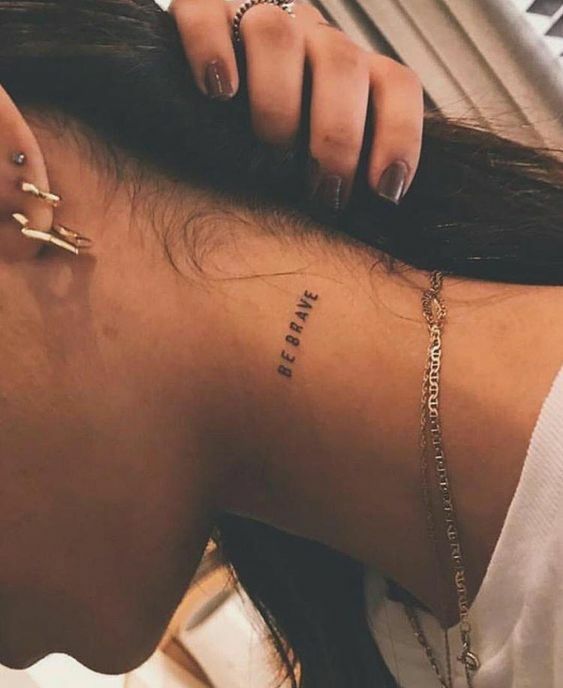 Getting a motivational tattoo with something that inspires you can serve as a daily reminder. You can choose to get your favorite quote or maybe even lyrics from your favorite song tattooed. Words of acceptance always help people move past difficult situations. 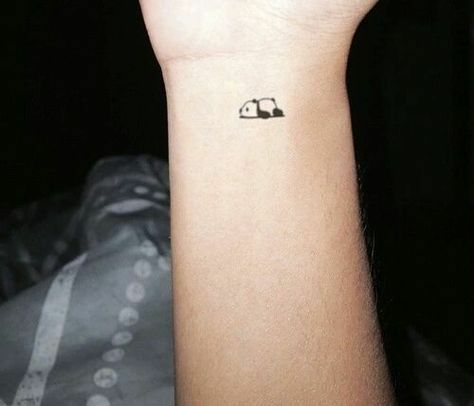 Getting a small tattoo like this can help remind you that something’s aren’t entirely in your control, which is okay. Another awesome way to motivate you is to remind yourself to be brave, even on bad days. 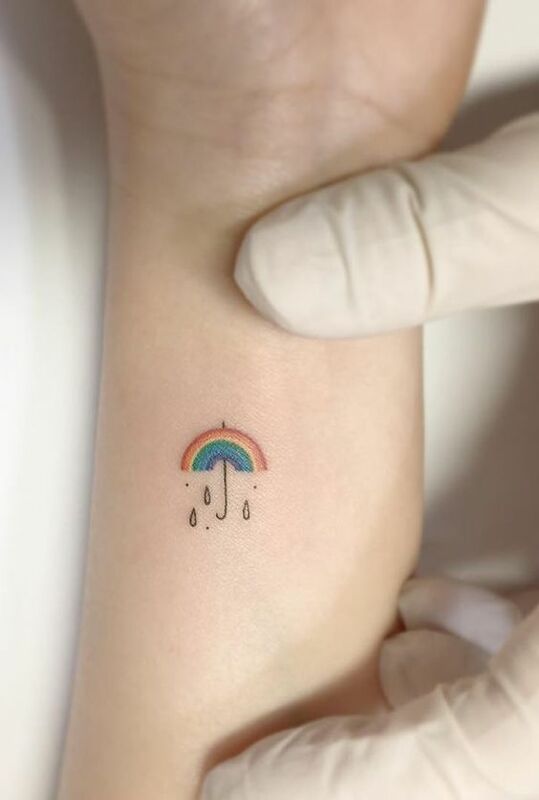 This beautiful small tattoo idea can give you all the courage you might need. 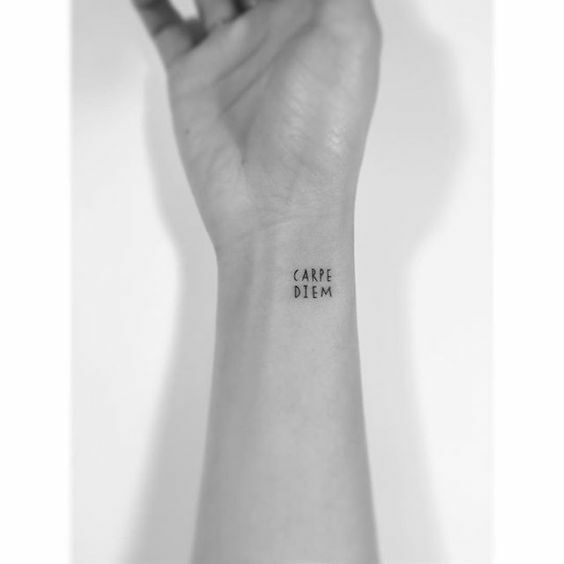 Carpe Diem is another reminder to enjoy life and live every day to the fullest. These two words can change everything when it’s practiced and it also serves to remind you to love each day. If you’re a girly girl and prefer something a little cute and dainty then these ideas would be ideal for you. You can choose something that you perhaps hold close to your heart. 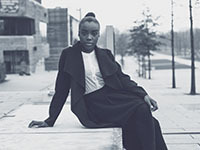 Home is where you feel safe, protected and happy and this could be different places to each individual. 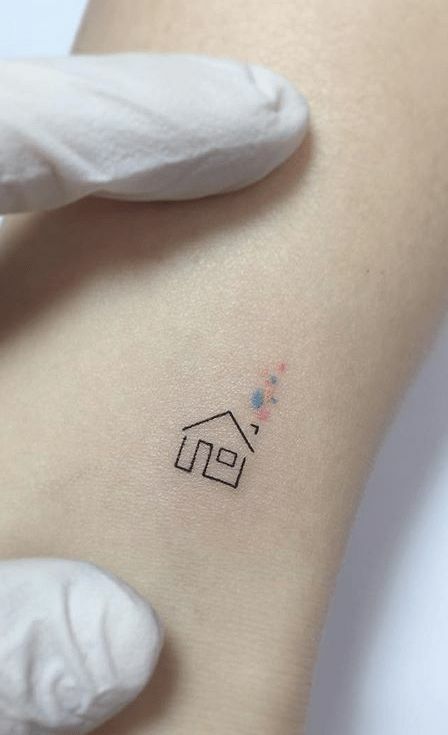 Perhaps get a small house tattoo on your wrist and add on some watercolors that can represent people. These people can be all of those who make you feel like you’re home when you’re with them. Dainty tattoos always look good and don’t look messy and all over the place. 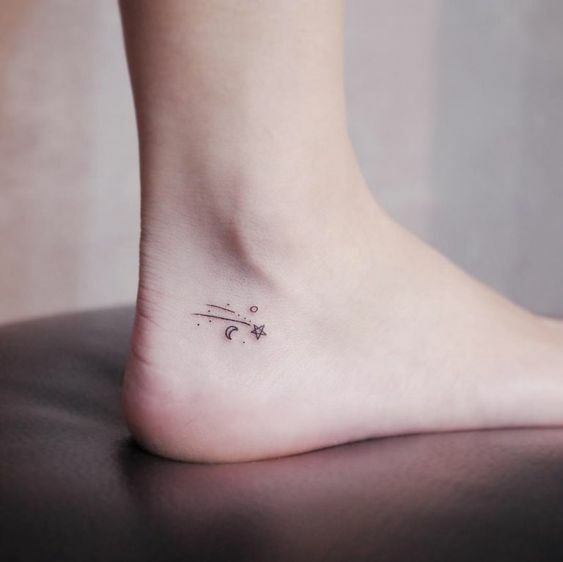 This falling star/ shooting star is a beautiful symbol that will look good on any area of the body. 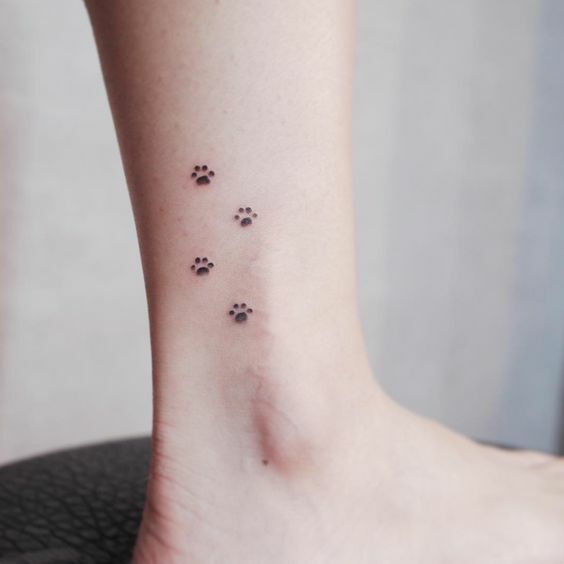 If you’re someone who loves animals and can’t get enough of your pets then it’s time you get them inked to your body. Rabbits are extremely cute and plenty of people are obsessed with rabbits. 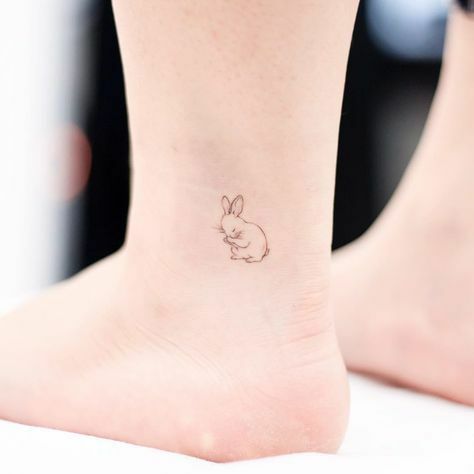 This cute rabbit tattoo inspiration is ideal for all the bunny lovers out there. There isn’t a cuddlier animal on earth than a panda. This inspiration is perfect for people who are panda obsessed and can’t get enough. Dogs are men’s best friends- and there isn’t a better way to honor your best friend than by getting paws tattooed on your leg. You can have the actual paws of your dog inked just to make it more personal, along with his/ her age. 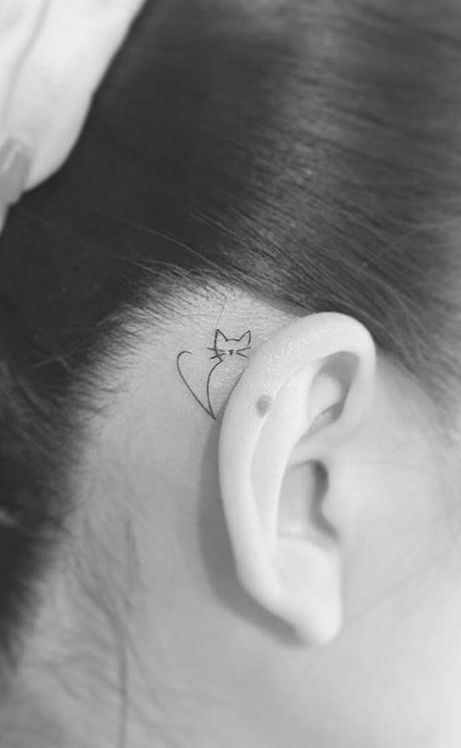 If you aren’t a dog person, we’ve got a wonderful cat tattoo idea. It is done behind the ear and resembles a peeping cat which also happens to be extremely adorable! If these ideas still don’t help and you’re looking for something completely unique altogether then keep reading. 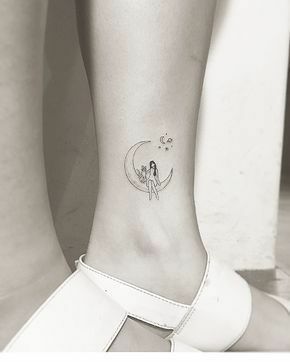 These small tattoo ideas are placed in different areas that aren’t really popular. You can choose different areas, depending on how visible you’d like your tattoo to be. If you’re a conservative and private person than choosing spots that not everyone can see is a good idea. On the contrary; if you like people seeing your ink then you can opt for a more out there area. 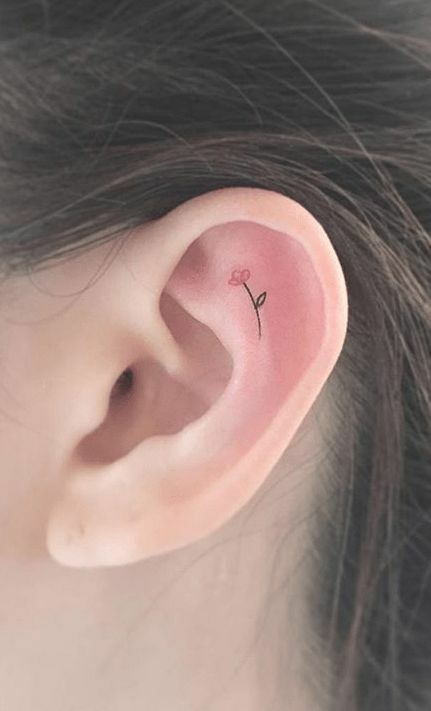 The inner ear is a spot that not many people have gotten tattooed. It looks good but the only downside could be that these tattoos might hurt a lot more than normal. The reason for this is because the skin is way thinner, which could be painful. 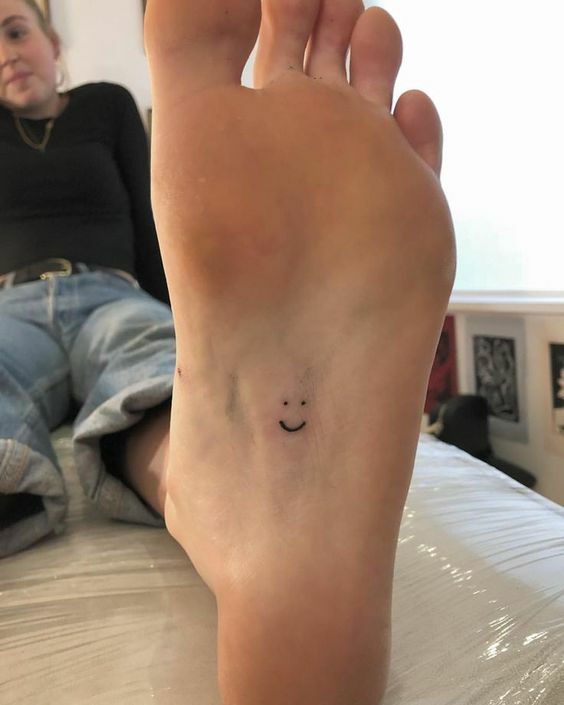 Another unique place to get a tattoo is under the feet. No one really will ever see a tattoo in this area, unless you show it to them. It can remain a mysterious thing that no one will ever know about, which is really cool. After you’ve gotten inked it’s vital to look after your tattoo. Aftercare is essentially the most important part of the healing process. 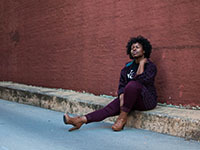 Everyone heals differently and everyone experiences different levels of pain. If you’re afraid about the pain, speak to your tattoo artist. Keep the area clean regularly to avoid any infection from forming. Rinse the area with clean water and follow the instructions given to you by the tattoo artist. Another very important thing to avoid is direct sun expose to the skin immediately after getting a tattoo. Before deciding what tattoo to get its most important to find a tattoo artist who knows what they’re doing. 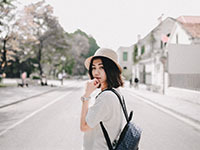 Search online and ask people around for recommendations, so that you can go to an experienced artist who will give you exactly what you want. If it’s the first time you’re getting a tattoo ensure that you have done plenty of research. Make certain to know everything that there is to know about tattoos. 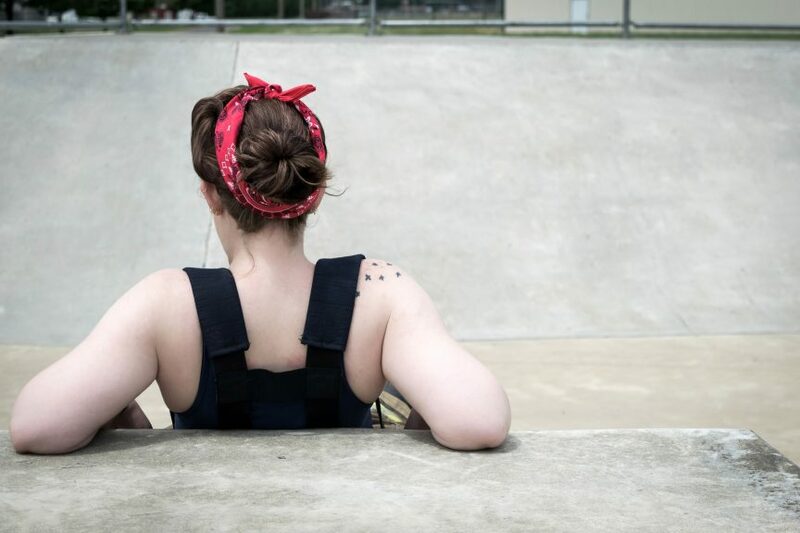 Read up on aftercare and health concerns that come along with getting a tattoo. Remember that a tattoo is a lifetime commitment which you will carry with you every single day. Choose wisely and go for something that is versatile. If you’re not entirely sure what to get then we’d suggest that you wait until you’re completely sure. This way you won’t be wasting money and neither will you be getting something that you may regret.